Things here have been a little hectic for the past 3 or 4 days… but not in a bad way at all. The little boys were home with me Friday for a teacher workday, and they didn’t eat me out of house and home. I took them to the library where Andrew hacked the computer in the children’s section (leave it to my kid to do the one thing I told him not to) and Evan tried to check out every single book at eye level (like me, he is a voracious reader; I love that). Saturday morning equals soccer, except the sky fell here on Friday night so our game was cancelled. My momma called to tell me she was missing the boys and could she please have them for Saturday night? I’m sorry, Momma, did you say you wanted to give us a Saturday night off with no little boys? Let me introduce you to the rail buggy, which I think might have been Chad’s first true love. We have a blast in this thing. It is also a work in progress. My sweetheart built this super contraption from the ground up… I think he’s been working on it since he was 17 or 18 years old. Because it’s a mish mash of old Volkswagen Beetle parts it requires a certain amount of maintenance and finesse (the kind of finesse that bangs on things with hammers). It. Is. Fun (please note the capital “F”). But rail buggy is a two-seater. Which means that if Chad and I are gonna go anywhere together in it, little boys cannot be home. So this weekend, with no kiddies for a day, we did just that. We went to get coffee. We went to Chad’s grandma’s. We drove the super-long-two-lane-winding-road-way to everything. We went through the McDonald’s drive-thru where the guy tried to hand us our drinks in a cardboard drink carrier, like as if we had anywhere to put that. We got a little sunshine on our cloudy day. I got mud splashed on my jeans (and Chad did not… on purpose? ya think?) and sported some crazy wind blown hair. On Monday my sister, Lindsey, came to visit me. We parked at the kitchen table with mugs of coffee and Cranberry Coconut Banana Oat Muffins and just got all caught up on things… for hours. I enjoyed it immensely. Tuesday I had to catch up on all the crap I didn’t do on Saturday, Sunday, and Monday. And let’s not forget soccer practice. Evan also volunteered me to make 984 (okay, maybe not quite that many) Easter cookies for his class and decided to give me only 12 hours notice (including the time that normal people are sleeping). The point of all this is that I have been a little busy, but when I’m busy I still cook. Busy requires quick. Like lickety-split (I’m sorry… I just couldn’t help myself right there). And I don’t know about the rest of you, but Easter is descending on me faster than I can get a handle on it. So while I am planning a brunch menu, dyeing Easter eggs, and contemplating large quantities of chocolate with bunny ears, my family still has to eat. Lemony Chicken Saltimbocca will make you feel really fancy, even when your schedule is pinched. You will need a fistful of sage. I picked mine from this pretty plant that Chad’s grandma dug up out of her garden to give me. Sprinkle thinly sliced chicken cutlets with a little kosher salt. Place several slices of the fresh sage on each piece. Wrap the chicken with bacon, securing the sage in place. Note: the original recipe calls for proscuitto, but I wasn’t about to try to fit standing in line at the deli into my schedule, so I used bacon (cause it was in the fridge). I do opt for a lower sodium center cut variety with my bacon, though, so I don’t feel quite as guilty. Heat a little olive oil in a large skillet and brown the chicken cutlets until they are done- about 2 minutes on each side, depending on thickness. Remove the chicken from the skillet and set it aside. While the chicken is cooking, whisk together chicken broth, cornstarch and the juice of one lemon. Add another teaspoon of olive oil to the already hot skillet and then pour in the lemon/chicken broth/cornstarch liquid, stirring constantly. Bring it to a boil and continue cooking for about a minute, pulling in the browned bits from the cooked chicken as you still whisk continuously. The sauce will thicken. Spoon it over the waiting chicken breasts and serve promptly. Sprinkle each chicken piece with kosher salt to taste. Place 3-4 sage leaves on each piece and then wrap with the bacon or proscuitto slices to secure into place. Heat the oil (except for one teaspoon) in a large skillet. Add the chicken pieces and cook until done, about 2 minutes on each side. While the chicken is cooking, whisk together the chicken broth, lemon juice, and cornstarch. Remove the chicken and set it aside. Heat the last teaspoon of oil in the skillet and whisk in the lemony chicken broth mixture. Bring it to a boil, stirring constantly, and sauce will thicken after about a minute. Spoon the sauce over the cooked chicken and serve immediately. A Whole Buncha Things. And Cake. There is always enough time for M&M’s. Tying things up with bacon, excellent! Thanks! Bacon makes everything better. Love the pastel color on the cookies. The chicken looks delicious. You know i am totally into the bacon. Rail buggy looks fun. It IS fun 🙂 I am also all about the bacon. That buggy looks like some serious fun! I would have to wear body armor because I’m certain I would be the one to roll it! This recipe sounds delicious – but I’m saving it until I have fresh sage in the garden! Oh you should! 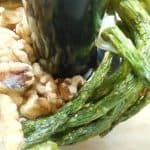 It is so quick and easy– I lucked out with the fresh sage (it is super expensive to buy it), but this meal is simple for any day of the week! This looks fabulous!spencer is drooling over this.must try this. Do it! It was really fast and easy. Lemon sagey chicken yum.